This post is from several years ago but it hits me where I live even now. Some of the liturgy quoted may not relate to this year because it is older, but it is all close enough. In his commentary on this portion of the Mass last year, our priest pointed out that the Triduum is one extended liturgy. For the first time I understood why we read the entire passion and crucifixion during Palm Sunday's liturgy. It is to give us a preview of what we are to be meditating on during this week. It is to give us a chance to enter fully into that journey Jesus is taking which culminates with his Passion, Crucifixion, and Resurrection. It is to give us the chance to accompany him not just as a spectator, but as a friend. Let us "Stop, no more of this" as we concentrate on what matters most now. This year, our priest had a three sentence homily and it hit the nail on the head. When talking to his spiritual advisor about troubles and trials, he was told, "You are having these problems because you are avoiding the Cross." Aren't we all? For my own part, I faced a severe internal struggle last week. Then God in his goodness made me understand that I was causing my own turmoil because I was trying to squirm out of the Cross. At that point I gave up wanting my way. And I was able, with St. Josemaria Escriva, to say, "Is that what you want? Then I want it too." that I regained peace and calm. I still had to face the Cross, but it was not so big a cross as the one I was creating for myself. This is why I need Lent every year. I forget this lesson so easily. And life is so much simpler when I live without avoiding the Cross. Let's face it ... I'd face that Cross anyway. But when I do it squirming and turning away it is so much more difficult than when I slip my hand in God's and follow my Savior's example. Let us walk with him this week. 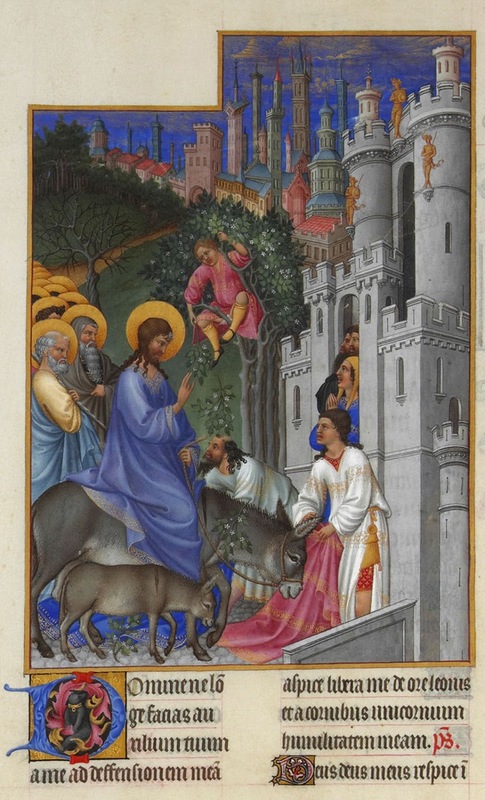 Les Très Riches Heures du duc de Berry, Folio 173v - The Entry into Jerusalem the Musée Condé, Chantilly. I wish I could harness all the time and energy I have spent kicking and screaming. We have to remember daily that "... his burden is light"... is that non-heavy or non-dark? or both?